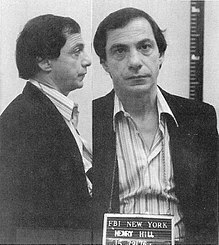 Henry Hill (June 11, 1943 – June 12, 2012) was a former Irish-Italian American mobster, Lucchese crime family associate, and FBI informant whose life was immortalized in the book Wiseguy, written by crime reporter Nicholas Pileggi, and the 1990 Martin Scorsese film Goodfellas, in which Hill was played by Ray Liotta. He was the owner of a restaurant called The Suite. If you can't love two people at once, there's something wrong with you. Heather Alexander (2008-03-29). Mafia king on the straight and narrow. BBC News. Retrieved on 2008-03-31. This page was last edited on 5 September 2018, at 13:15.